Let our leadership with over 150 combined years of educational and leadership experience guide, counsel and support you in your journey of becoming a ‘five-star’ doctor equipped and ready to face the challenges of tomorrow. Doctor of Medicine program is derived mainly from the American Medical Education System. The MD program consists of 2 phases: Basic Science and Clinical Science over 4.5 years. Basic Science of the MD program consists of 5 semesters. Clinical Science is about 6 semesters. Students who do not have the required 90 credit hours including the required subjects such as Chemistry, Physics, Biology, Math, and English are required to complete Pre-Medical courses before matriculating into the MD Program. The combined Pre-med and MD program is of 5.5 years duration. The Basic Science portion of the MD program is completed in St. Lucia. After successful completion of the Basic Science phase, students move on to the Clinical Rotations phase. 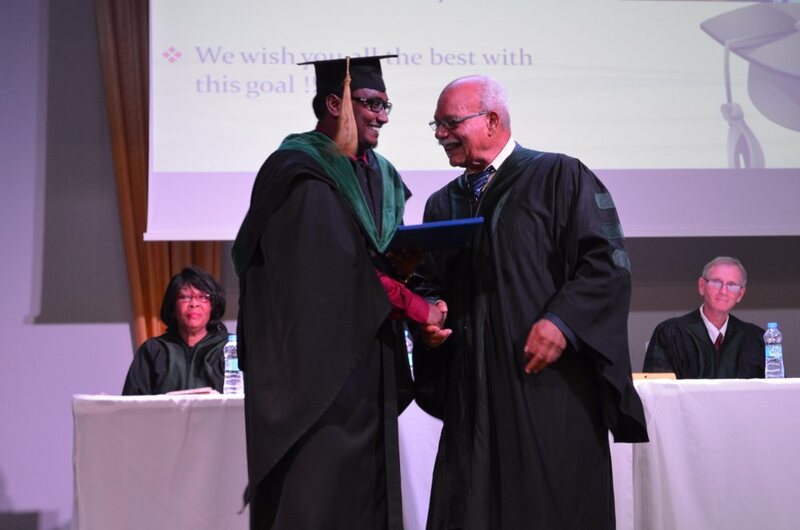 This last 2 years of the program can be performed in India (elective rotations), Jamaica, Trinidad & Tobago, or the USA at our affiliated hospitals. At AIMU, a solid science foundation is essential for the Basic Medical Sciences. Students are required to complete about 137 credit hours of course work in five (5) semesters of 16 weeks. In the Clinical Clerkship program, there is an emphasis on preparing students for practice in hospital and ambulatory settings. AIMU has developed innovative ways to teach medical students the clinical skills they will need to function as a physician. The core clinical clerkship includes 44 weeks of family medicine, pediatrics, internal medicine, Obstetrics Gynecology, Surgery and psychiatry, with 28-week electives in various departments in hospital settings. The Basic Medical Science courses are presented in lecture format and power point presentations, combined with laboratory exposure to allow for visual reinforcement and development of analytical skills. AIMU requires students to pass the NBME Comprehensive Basic Science Exam before proceeding with the Clinical Clerkship. The strong preparation provided by the Basic Medical Science supports the student in achieving this important transition. For the student to be eligible for the clinical rotations he/she must have successfully completed the Comprehensive Basic Medical Science Examination conducted by the National Board for Medical Education (NBME) at the end of the 5th Semester of the Basic Medical Science program. The clinical program falls in the third and fourth year of medical education.The clinical rotations are performed at hospitals in the United States and Saint Lucia. The program in USA is conducted at ACGME affiliated teaching hospitals through our clinical administration office located in Maryland, near Washington DC. These clinical facilities are state of-art teaching hospitals under green book category. These facilities provide the student with superior clinical exposure that will ensure better career options. To undergo the Clinical Clerkship Program in USA, a student should complete Basic Medical Science Program along with USMLE STEP 1. The clinical program in Saint. Lucia allows such integration to be possible. Students are encouraged to use their knowledge and skills creatively, whether it concerns the human body in health or disease. The prevention of disease and the promotion of good health are considered important aspects in educating a well rounded physician. Our students and graduates are eligible to apply to ECFMG for ECFMG Certification and USMLE® as a step towards ECFMG Certification. AIMU is listed in WHO (World Health Organization), World Directory of Medical Schools, and by PANHO (Pan American Health Organization). AIMU is listed with the Medical Council of Canada and students are eligible to appear for Canadian exams. AIMU students are eligible for the Medical Council of India Screening Test, also known as Foreign Medical Graduates examination (FMGE), completion of which will allow the students to practice in India.